Get the gift that keeps on giving with our Amish Carlisle Convertible Crib. This Amish handmade crib can be transformed into a day bed for your toddler and then a full bed for you child as they grow up with the appropriate rails purchased. All of our convertible cribs meet federal safety standards. Safety is of utmost importance at DutchCrafters. Handcrafted in your choice of either solid oak wood or solid brown maple wood, this Amish crib will easily transition into a full bed for your child and last for generations! After your child moves out, the crib you bought when they were born will be able to be utilized as a guest bed when family comes to visit! 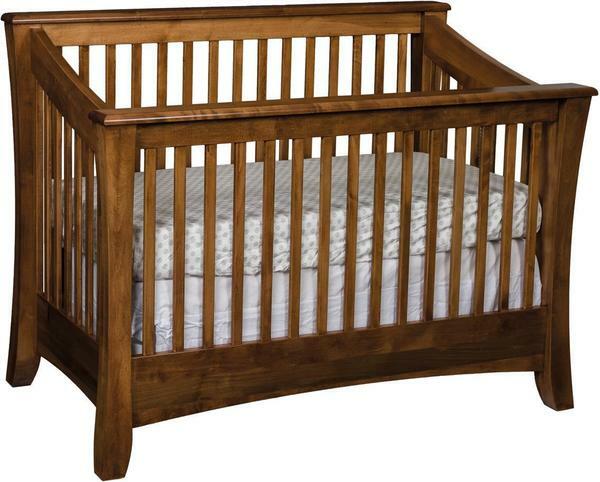 This solid wood convertible crib is really an investment that you can use for a lifetime. If you have any questions about this Amish handmade crib or any of our other Amish furniture, please give us a call at our toll free number - 866-272-6773. We can also be reached easily through email at Questions@DutchCrafters.com.